Friday was a bad day for tech, but Monday’s continuation might be worse. It’s taken a number of healthy stocks and hit them harder than most investors care to admit. It’s left many hoping that Apple (NASDAQ:AAPL) not only reports good numbers for itself, but as a way to save the rest of the market. With that in mind, let’s start with tech as part of our top stock trades. The PowerShares QQQ ETF (NASDAQ:QQQ) is the go-to tech fund for many investors. With a big allocation to FANG, along with big names like Apple and Microsoft (NASDAQ:MSFT), why wouldn’t it be the top choice? 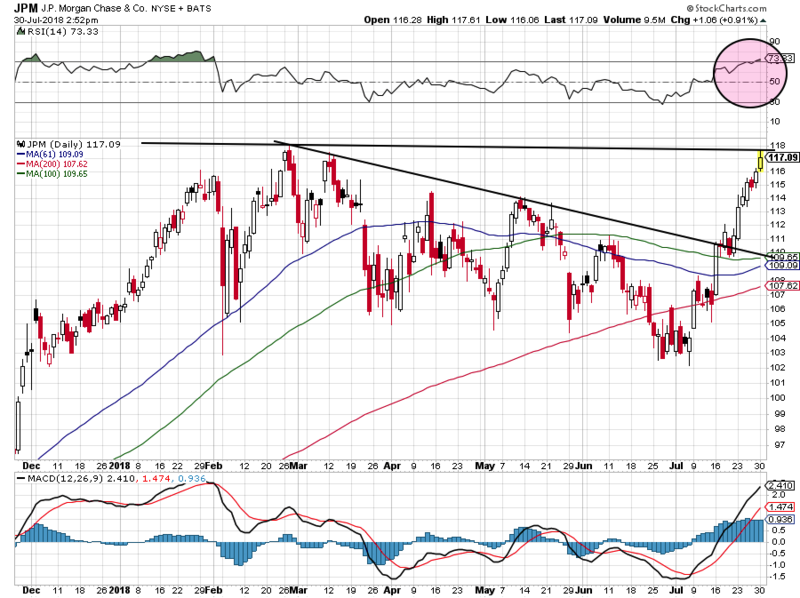 While the last few days have felt particularly turbulent thanks to Facebook (NASDAQ:FB) and Netflix (NASDAQ:NFLX), the QQQ is actually trading all right. 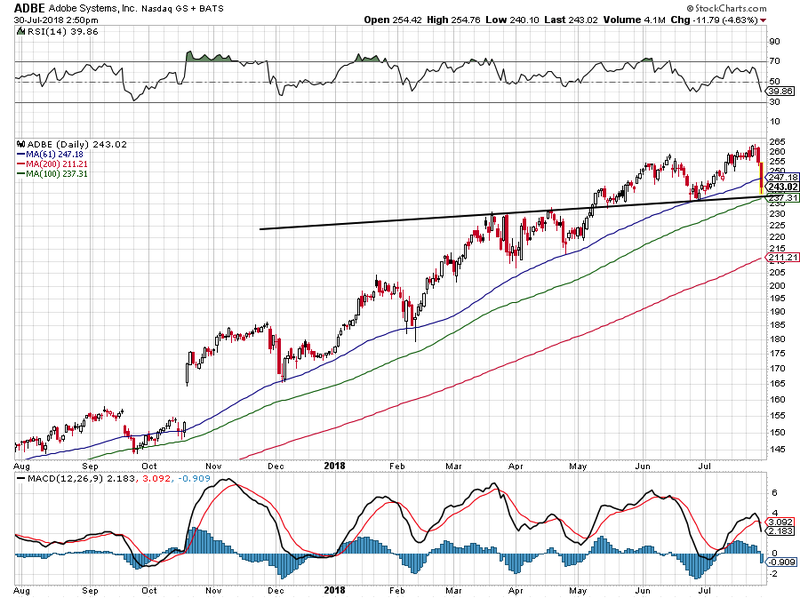 It’s uptrend from April is still in play, while the 50-day moving average is just below. This moving average was strong support on the last pullback. Finally, there’s decent support from the prior breakouts near $170 and $173. That’s a lot of support in a concentrated area and in all, I wouldn’t get terribly bearish on QQQ until it falls below $170. Adobe Systems (NASDAQ:ADBE) has been one of the market’s best performers, but it doesn’t feel that way lately. On Thursday shares made a new all-time high, nearly brushing $265. But Friday shares tumbled and on Monday they fell another 5%. Neither decline has been the result of any news (at least, none that I have seen). A $20 per share decline in two days feels pretty unwarranted to me considering the high quality of the business. But what does the opinion of a shrimp matter to the ocean? We shall trade what we are given; nothing more, nothing less. 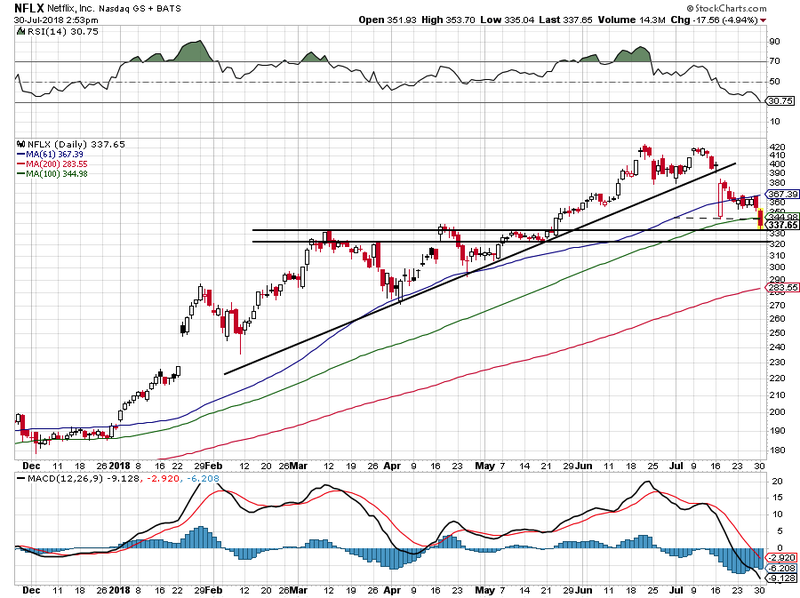 Shares easily knifed through moving-average support on Monday and Adobe is threatening to touch its 100-day moving average for the first time since September. Should it do so, it should at least provide a bounce, even if it’s short-lived. Today’s lows might warrant a bounce, as shares neared level support as well. Investors could buy near current levels and use a close below the 100-day as their sign to exit. Box Inc (NYSE:BOX) captivated investors this year after its explosive move over $24 and run toward $30. 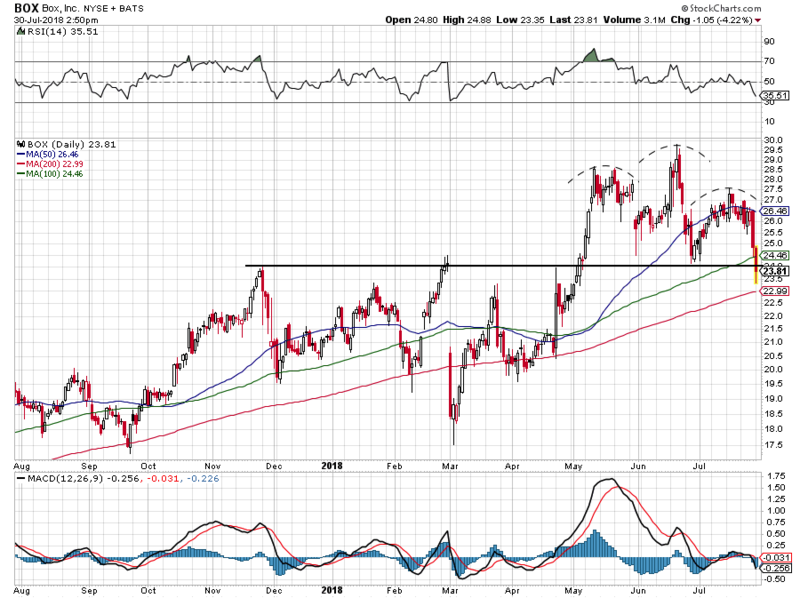 A few times now Box has retested this breakout level and it’s held as support. Not on Monday though. Keep it super simple: Below $24 and traders should not be long Box. Above $24 though and it’s fine. Is this a head and shoulders here? Perhaps. But keep your risk limited with the +/- $24 strategy. Please don’t tell me you’re surprised by the decline in Netflix. Up more than 100% at one point this year, it was a perennial buy-the-dip name. On the way up, bulls said forget about free-cash flow and don’t worry about the bottom line because it’s all about subscriber growth. But when subscriber growth whiffed for the quarter and guidance missed by a wide margin, the buy-the-dip strategy was based on what exactly? Now below its earnings-day low and 100-day moving average, things got ugly quickly for NFLX. Also look how that 61-day moving average kept NFLX in check on the rebound. Now $320 to $335 needs to hold as support. If not, $300 is in the cards and possibly a date with its 200-day moving average. The one bit of good news? Financials keep winning and specifically, the banks. JPMorgan (NYSE:JPM) has been a total beast. After beginning the month around $102, it neared $118 on Monday. 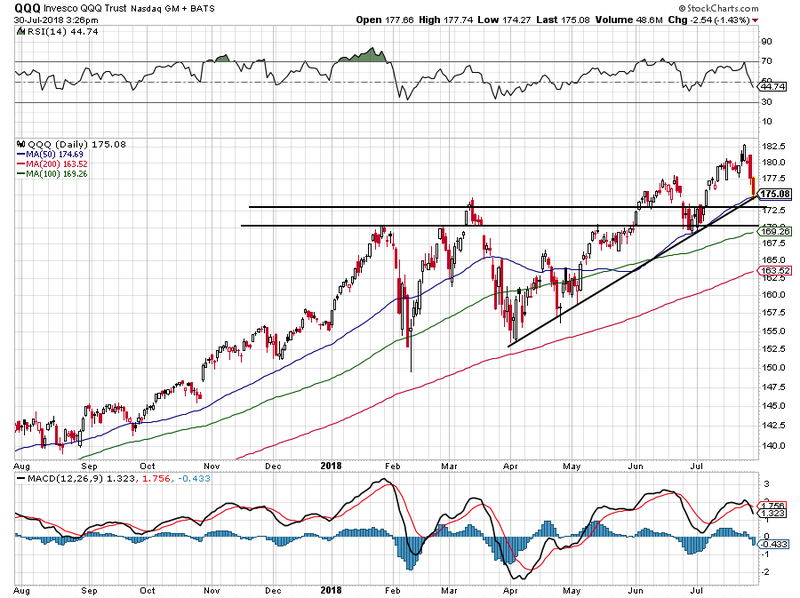 With an overbought RSI (pink circle) and retesting prior resistance, it’s probably prudent to book to some gains. JPM is a big-time winner though. It’s got a low valuation, good growth and solid dividend yield. This is a buy-the-dip stock if I’ve ever seen one. Bret Kenwell is the manager and author of Future Blue Chips and is on Twitter @BretKenwell. As of this writing, Bret Kenwell was long BOX and ADBE. 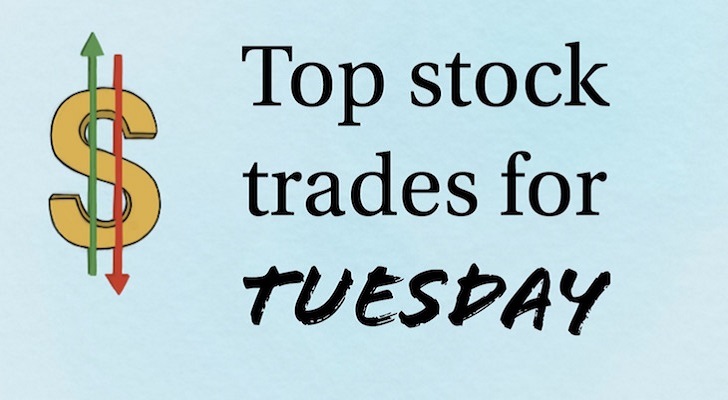 Article printed from InvestorPlace Media, https://investorplace.com/2018/07/5-top-stock-trades-for-tuesday-qqq-jpm-nflx-adbe-box/.